The Phantom of the Opera is a musical by Andrew Lloyd Webber, based on the French novel Le Fantôme de l'Opéra by Gaston Leroux. The music was composed by Lloyd Webber, and most lyrics were written by Charles Hart. Additional lyrics were written by Richard Stilgoe. Alan Jay Lerner was an early collaborator, but he withdrew after completing work on a single song, Masquerade, and died shortly thereafter. The central plot revolves around a beautiful soprano, Christine Daaé, who becomes the obsession of a mysterious, disfigured musical genius. The Phantom of the Opera opened in the West End in 1986, and on Broadway in 1988. It is the longest-running musical in Broadway history, the second-longest-running West End musical, and arguably the world's most financially successful single entertainment project to date. 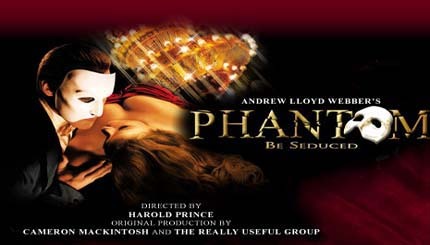 Phantom won the 1986 Olivier Award and the 1988 Tony Award for Best Musical, and Michael Crawford won the 1986 Olivier and 1988 Tony for Best Performance by an Actor in a Musical. The show has been seen in 149 cities in 25 countries, and has played to over 100 million people. With total worldwide box office receipts of over £3.5bn ($5.1bn), Phantom is the highest-grossing entertainment event of all time. The New York production alone has grossed US $715 million, making it the most financially successful Broadway show in history.